Grant cleaning and inspecting permissions to your users, and empower their mobile devices. You and your extended staff of cleaners and inspectors can now be tracked and organized all in one convenient place. Cleaners: Tap a simple check-box to indicate property is clean. This is recorded in your Bookerville account and a history of cleanings is kept. Inspectors: Tap a check-box to indicate property has been inspected. An inspector can be the same person as a cleaner, or different. History is recorded and retained as well. Damage, Theft? Inspectors can report damage, theft, evidence of over-occupancy, or other issues, violations of contract or terms & conditions. Comments can be posted while they are right there, from their mobile device. Photos: Inspectors can take photos from their phone and upload them to your account - great for documenting damage or other issues, or also capturing the condition of the property before a check-in. Photos are retained for each inspection so you have them for posterity. 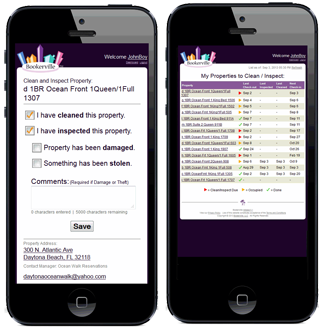 Mobile Check-List: Easy-to-use list of properties helps cleaners and inspectors manage and report their work. Cleaners and inspectors also get quick, convenient links to contact you by phone or email, and also the property address which links to their mobile Maps application to help them get to the location. Your Dashboard At-A-Glance tab has been updated with a new box to help you stay on top of cleaning and inspecting schedules. It shows properties with approaching check-ins that have not been cleaned/inspected since the previous booking. There is also a report to show cleaning/inspecting history, with quick links to see the details of each cleaning/inspection with comments, photos, and more. Housekeeping helps not only you, but also your extended staff to stay on task, manage work schedules, and report cleanings and inspection issues.